S I G N & D I G I T A L G R A P H I C S • October 2014 • 101 C reated by Formetco, an outdoor sign company in Duluth, Georgia, the electronic billboard was launched in July of this year during Artscape, the largest outdoor arts and entertainment festival in the United States. The massive sign—made up of 26 LED cabinets and Paula Aven Gladych is a freelance writer based in Denver, Colo. She can be reached at pgladych@ gmail.com. 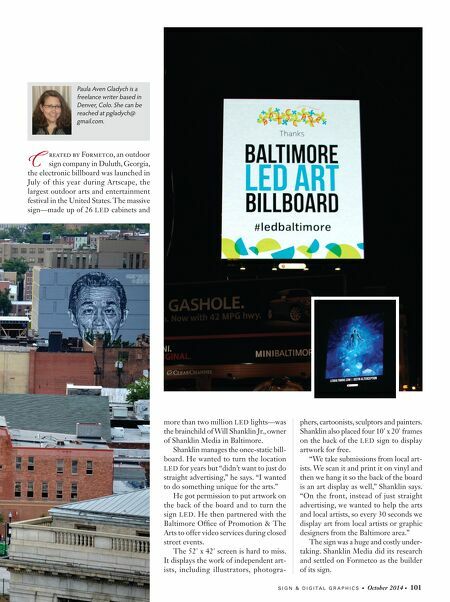 more than two million LED lights—was the brainchild of Will Shanklin Jr., owner of Shanklin Media in Baltimore. Shanklin manages the once-static bill- board. He wanted to turn the location LED for years but "didn't want to just do straight advertising," he says. "I wanted to do something unique for the arts." He got permission to put artwork on the back of the board and to turn the sign LED. He then partnered with the Baltimore Office of Promotion & The Arts to offer video services during closed street events. The 52' x 42' screen is hard to miss. It displays the work of independent art- ists, including illustrators, photogra- phers, cartoonists, sculptors and painters. Shanklin also placed four 10' x 20' frames on the back of the LED sign to display artwork for free. "We take submissions from local art- ists. We scan it and print it on vinyl and then we hang it so the back of the board is an art display as well," Shanklin says. 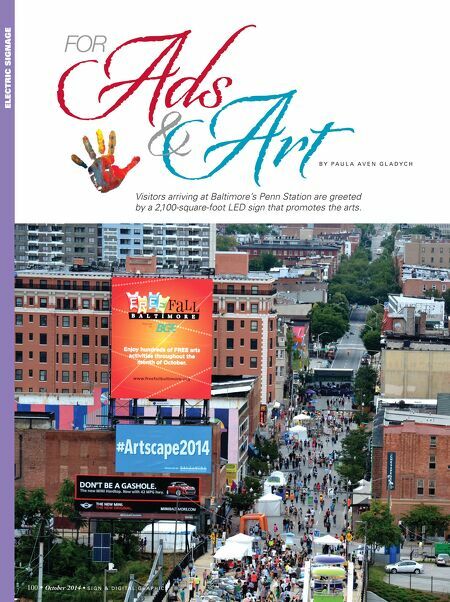 "On the front, instead of just straight advertising, we wanted to help the arts and local artists, so every 30 seconds we display art from local artists or graphic designers from the Baltimore area." The sign was a huge and costly under- taking. Shanklin Media did its research and settled on Formetco as the builder of its sign.